It’s almost hard to believe the long life of the Cassini spacecraft is nearing its end. In 2017, after 20 years in the Saturn system, NASA will send it crashing into the planet. Until then, it’s on a farewell tour to some of the ringed planet’s many moons. 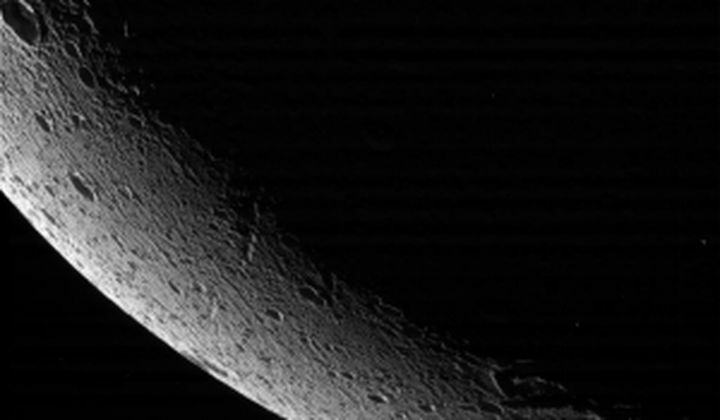 On August 17, Cassini performed one last flyby of the moon Dione, a small rocky body pocked with craters, not unlike our own moon. In fact, it orbits Saturn at the same distance our moon orbits Earth, and is also tidally locked, so the same side always faces the planet. Dione gets showered with ice from the geysers on nearby Enceladus, and interacts gravitationally with its many sibling moons, which you can read more about here. The Cassini team published the first images sent back from this last flyby, including the one at right. The spacecraft will visit Titan again (not for the last time) on September 28.